Feature: Chocolate Chip Bar Cookies: In the Oven in < 10 Minutes! These Chocolate Chip Bar Cookies give you all the flavor of a traditional chocolate chip cookie recipe, but this recipe saves baking time and clean up time. They'll be in the oven in less than 10 minutes -- and out of the oven less than 20 minutes later. 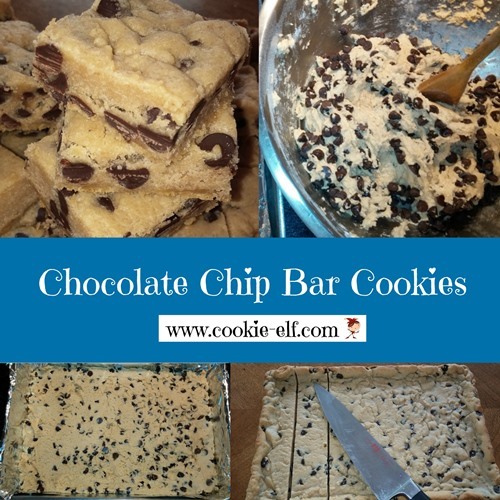 Get the full recipe for Chocolate Chip Bar Cookies. And you can see all kinds of chocolate chip cookie variations on our Chocolate Chip Cookies Pinterest Board. 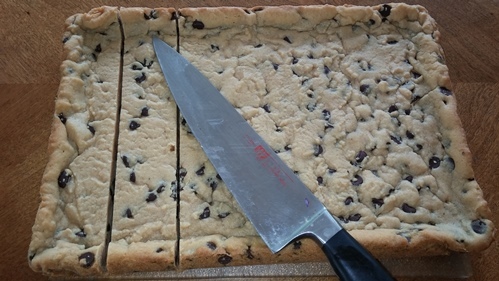 Typically bar cookies can be too dry and too hard – a danger inherent in the size of the pan. It can be tricky to make sure the entire pan of cookie dough gets baked. But by waiting for the edges to brown and the surface to look done, you inadvertently leave the cookies in the oven too long (even by just a couple of minutes). Bake bars at a slightly higher temperature than normal (375º F) in order to set the cookie dough. Remove bars from the oven before the cookie surface or edges turn brown. Remember, the bars retain heat and continue to set after they are removed from the oven. Don’t let a light-colored surface lure you into leaving the bars in the oven too long.